Technically, it isn’t the Last Day. That will come in about a month and a half when we close the books. 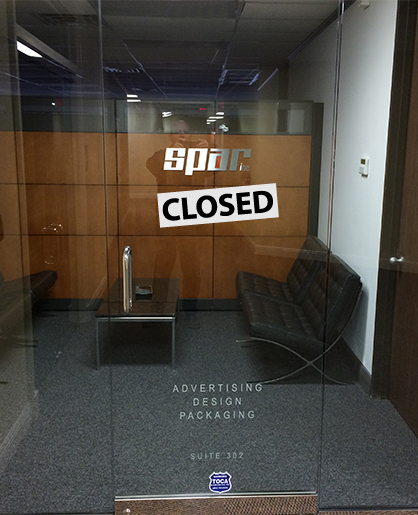 But it is effectively the Last Day for SPAR, Incorporated, because it is closing its doors forever. SPAR was born December 17, 1956. I have worked at SPAR since January 1973, forty-three of SPAR’s sixty years. I began as a graphic designer right after my discharge from the Air Force, then art director, then creative director, and finally general manager. SPAR is closing because I am retiring, and the owners of the company decided they are in the beverage/alcohol business and not advertising and saw no need to keep SPAR open. The small profits we generated were “pocket change” for the owner. There are seven of us (including me) who call ourselves “SPARtians.” (Bet you can’t guess why? Oh, you did guess correctly.) SPARtians are like family, complete with highs and lows and even a few spats from time to time. We went through the birthing of babies, the pain of personal losses, several moves, and being flooded by Katrina, in which we almost lost the business only to come back with one of our most profitable years. Through it all we were SPARtians drawn together by a common purpose, a deep personal fellowship, and a long history willing to pull together for our common good. Of the six who are losing their jobs, the shortest tenured has been with me just shy of ten years, the longest for almost three decades. You can’t be around someone for that long for five days a week and not develop some level of attachment. Nor can you bring talented people together to create without them leaving a legacy, and SPAR’s legacy is huge. We designed some of the most famous beverage/alcohol packages and branding in existence, including the Buffalo Trace Distillery and Buffalo Trace Bourbon, Sazerac Rye, the Buffalo Trace Antique Collection, WL Weller, Mr. Boston’s, Ten High, Nikolai Vodka, CLIX, Herbsaint, and Caribou Crossing just to name a very few. Sadly, we never got to complete one project, taking it right up to final approvals before we closed. I cannot give details or the brand name, but we redesigned one of America’s iconic brands. Hopefully, the designs will eventually be brought to market. I have no doubt that some of our designs will live on for many decades, maybe even longer. It is painful to see these talented people go back out in the world and look for a job. All have families and financial responsibilities to meet. While the company is giving them a severance package to help in that transition, it softens the pain of the change and the sharpness of the fear very little. They are all capable people, and should be able to find employment, but it is a hard world out there. After New Year, only my accountant and I will be coming into the office as we close the books on the company. I expect we will find the office to be quite “empty”—empty of the sometimes heated conversations about designs and presentations to clients, empty of the expressed frustrations when clients demanded some change we thought not wise, empty of the joy of seeing one of our designs approved and go on to win yet another design award, but most of all, empty of the laughter and even the tears we sometimes experienced as SPARtians working—and living together. I WILL miss that—and them. How do you tell these people goodbye? How do you express your love for them and appreciation for their support through the years? You don’t really, at least not adequately. Today, there was pain, and weeping, and hugging along with an unexpressed fear to say the word, “goodbye,” which sounds so final. There were vows to stay in touch and get together again for lunch—or something. But the truth be known, we will never again capture what we had for all those years as SPARtians. That’s because December 30, 2016 was the day SPAR died. Lynne, it has been a long time since we did business over a lunch or a conference table. Your advice on printing was always good and welcome. Best to you. It sounded like such a wonderful place to have been. But like all great things that come to an end, we must be happy for what was and not ponder on what was lost. Some people never achieve what SPAR was and brought to its family of workers. That should always bring some comfort of joy! Best Wishes to all of you as you begin new chapters in your lives. Thank you for sharing. Thank you, Dottie. It was a good ride.